This is a think-pair-share video that is done in a 7th grade math class. This video demonstrates how think-pair-share can be used in other subjects besides reading for comprehension of the content. Also it demonstrates how it can be used in a variety of grade levels. The video to the left, really hits on what think-pair-share is as well as demonstrates how it should be used and done in a classroom. This gives teachers a good start, and they can differentiate based on their students and their needs, such as ELLS. Definition/Description:Think-Pair Share is a collaborative learning strategy that allows students to communicate and work together to understand a reading, concept, solve a problem, brainstorm, or answer a question after they individually think. First students think to themselves, then they share their ideas with a partner or small group, and the last step is to share with everyone. The picture to the left is an example of a template that a teacher can use for student to write or draw down what they learned or discussed. For ELLs this will provide them with a visual representation of their work and discussion and will be there for them if they need to look back and remember. Justification: This strategy increases classroom participation because it allows all students to share their ideas thoughts and concerns. For ELLs it is sometimes hard to have them talk in large groups, but being in a small group or even a pair they might feel more comfortable and wiling to share ideas. Think-Pair-Share allows all students in the classroom to have a voice and they are prepared to engage in meaningful discussions. Many ELLs are known to have low self-esteem and often do not want to speak up in class, however when students are prepared and communicate with their peers they become more confident in their answer and are more willing to share their idea (Wright, 2015). According to Vygotsky, students learn best through interaction and collaboration with others. This strategy allows student to be collaborative in sharing ideas with others to gain a better understanding, as well as provides wait time, which for English Language Learners is essential in their thinking process and understanding (Gunning, 2012). Purpose: To allow student the opportunity to share their idea, understand more in depth the reading or question through the communication with a partner. To teach students how to slow down their reading and really understand the content. Asking questions to students, what is the homework, what was the story about, etc. Starting a new topic, such as what do students know about the weather? Asking questions to students, what is the high mountain, who invented the internet, etc. An article read in class on a certain topic. Starting a new topic, such as geometry, adding, subtracting. Asking questions or problems, example what is four time nine. 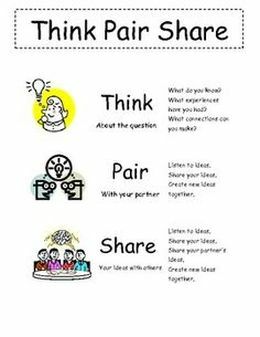 The picture below would be an excellent poster to provide for student in the classroom that has both visuals and written words to describe what Think-Pair-Share is and how to do it. The picture allow ELLs to use to understand what the text says, if they do not know a word. There has been research done that has show how visual representation and drawings help all students, especially ELLs and students with disabilities. (Marzano, 2010). Wright, W. E. (2015). Foundations for teaching English language learners: Research, theory, policy, and practice (2nd ed.). Philadelphia: Caslon Pub.